Searching for a weekend away with the kids? This is That: Travel Guide to Canada will teach you how to navigate the twelve petting zoos of Etobicoke and how to avoid pickpockets in Kamloops. Planning your next cross-country vacation? Keep in mind that the city of Brandon, Manitoba, is closed for annual maintenance between July 12 and August 19 and that tipping your server in Swift Current is offensive. 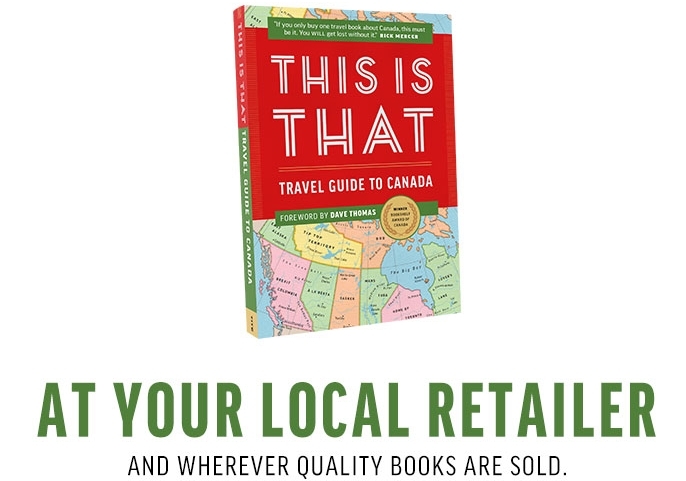 This is That: Travel Guide to Canada takes readers on an outrageous, farcical, and unbelievable journey from coast to coast to coast to coast to coast. Get rid of your copy of Fodor's Guide to Canada and burn that CAA map. This is That may fabricate the issues, but they certainly didn't fabricate this book. The team offers the challenge of selling the book to Harold Dalhousie, Canada's best book seller. This guide aims to help those unaccustomed to life in Canada. From how we move our bodies in an athletic sense to how we move our bodies in a transportation sense; from how we like to match our tattoos with our personalized license plates to how we pronounce the word “smoothie”—this book will have you feeling like an “oyster trapper” (regional slang for local resident) or a “potash pugger” (another regional slang for local resident) in no time.